How would you like to hit this at 70mph? It’s a dangerous trip going from Devine to Hondo on Hwy 173, and the holes in the Biry area are some of the worst. We hope that state leaders will be able to secure the emergency funds needed to fix it as the temporary patching does not seem to last long. Hwy 173 has heavy traffic all day long and it is just a matter of time before someone gets hurt. 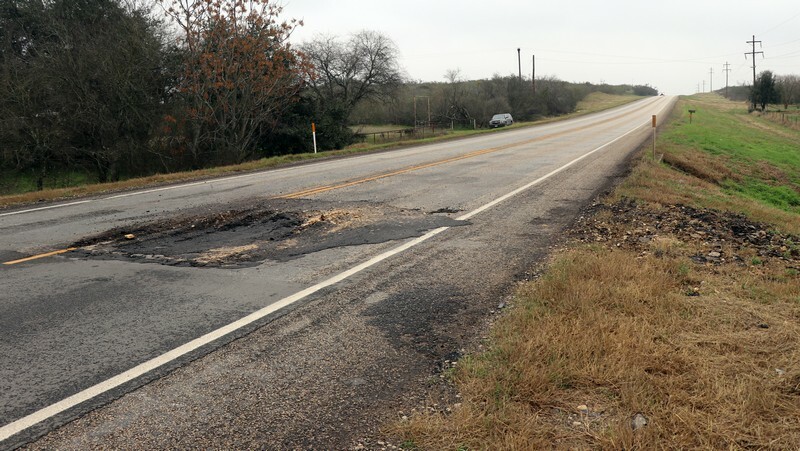 It’s no secret that Hwy 173 between Devine and Hondo is in need of a big rehab. There are big holes, small holes, and more popping up every day it seems. We see TxDot crews out there practically every day doing the best they can by putting temporary patches over the failing highway. While local are trying to do the best they can with what they have, it appears that emergency funding would be needed to if it’s going to get fixed anytime soon. 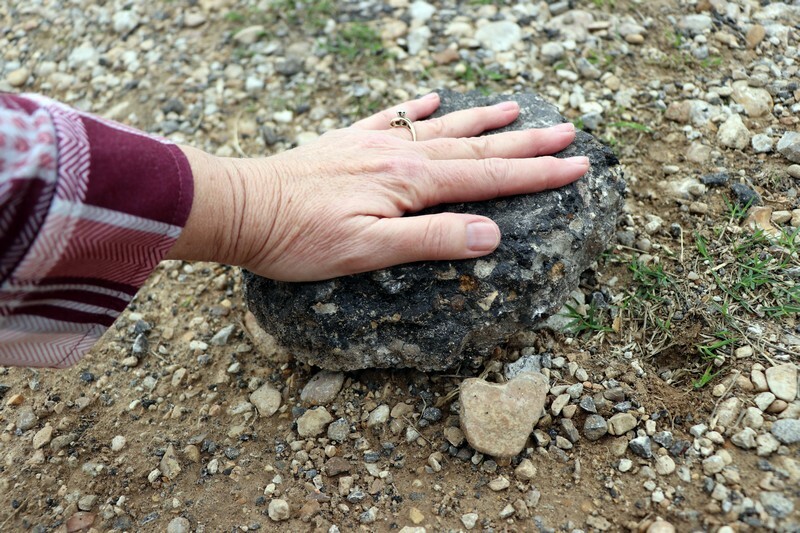 The 20-mile stretch with 70 MPH traffic has dozens of holes in the road where the asphalt just seems to have caved in….Some holes are bigger than others, but any of them are scary to hit at 70 MPH, with pieces of asphalt often flying up and hitting vehicles as you pass by the holes. 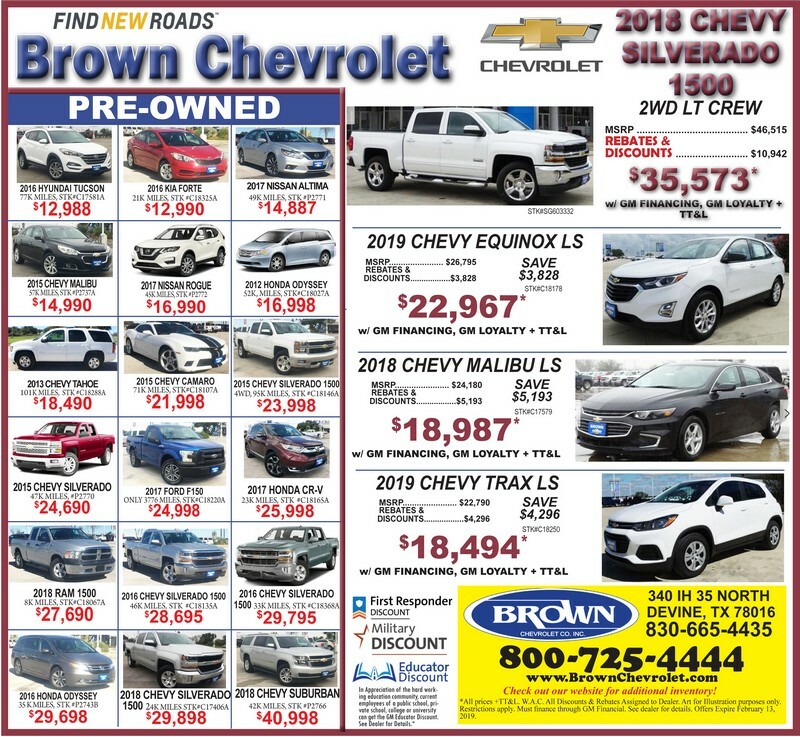 With several quarries north of Hondo, on top of all of the other Eagle Ford Shale oilfield traffic, the amount of heavy truck traffic in our area has absolutely skyrocketed in recent years. One of the things we saw happening was 18-wheelers veering into the lane of oncoming traffic or of the road as they try not to slam into the vehicles in front of them which are slowing down to dodge holes. Holes like the one above have been patched again and again on Hwy 173 between Devine and Hondo. The temporary patching only lasts a short time before it’s torn open again. 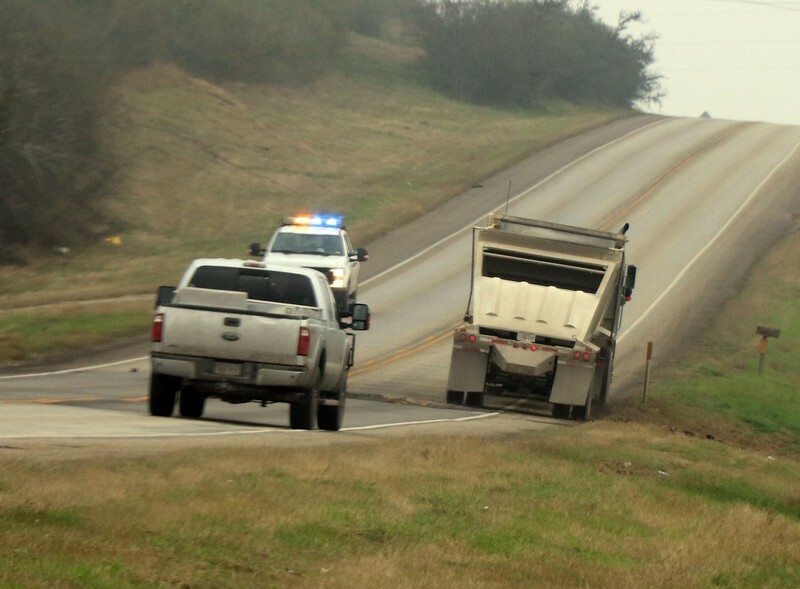 Reach out to Tx State Senator Pete Flores, Tx State Rep Andrew Murr, and Congressman Will Hurd to express your concern if you want to see the state find emergency funding to fix this dangerous, busy state highway. 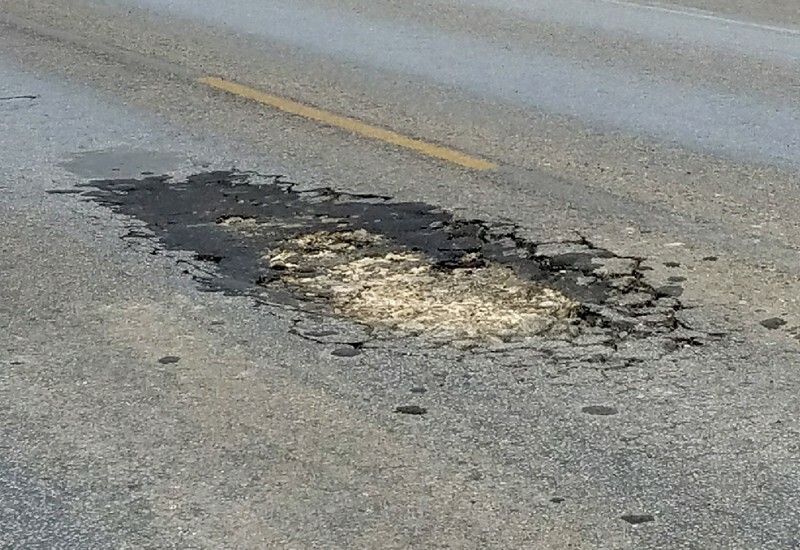 “It’s been bad for a long time, but it’s really gotten so much worse in the past few months,” said homeowner Henry Schmidt who has been watching TxDot crews patching the same big holes on Hwy 173 near his property, over and over again. “TxDot has been fixing the same holes out in front my house along Hwy 173 about every other week for several months now,” Schmidt said. “They send crews out here and it looks good for about 15 minutes but as soon as a few big trucks roll over it, it’s all torn up again. Local Medina County Sheriff Randy Brown and Medina County Commissioner Jerry Beck echo the concerns of so many local residents about Highway 173. Huge chunks of asphalt like this fly as drivers hit the dozens of holes along Hwy 173 from Devine to Hondo. Many, many windshields have been broken from flying asphalt along this stretch of road that gets more and more dangerous every day. We have submitted a public information request to ask how many Oversized Truck Permits have been issued in Medina County, which could take up to 10 days to be answered. According to our research a loaded 18 wheeler can weigh 80,000+ pounds, and oversized trucks that have permits to drive on roads like this can weigh100,000+ pounds. By comparison, a small passenger vehicle weighs between 4,000-5,000 pounds. According to one of his assistants, emergency funding for a project like this would most likely have to come through Senate Finance Committee — of which Sen. Flores is a member. Some pretty close encounters……The truck driver above is veering almost off the road to avoid a big pot hole. It’s a dangerous situation as drivers try to dodge the biggest holes by going into the lane of oncoming traffic or the shoulder to avoid holes. There happens to be a culvert and drainage area with no shoulder right here at the bottom of the hill, as the driver tries to avoid one of the worst spots at 70 MPH. The hole he is trying to avoid is shown at the top of the page. We did reach out to Congressman Will Hurd and have not received a response about Hwy 173 in Medina County. To Voice your concerns see contact info below…. Texas State Representative Andrew Murr can be contacted at (512) 463-0536 or (830) 257-0432 or you can mail a letter to Andrew S. Murr, PO Box 2910, Austin, Texas 78768-2910 or email him at District53.Murr@house.texas.gov. Texas State Senator for District 19 is Senator Pete Flores (512) 463-0119 or by email: peter.flores@senate.tx.gov or by mail at The Honorable Pete Flores, P.O. Box 12068, Capitol Station, Austin, TX 78711. US Congressman Will Hurd (210) 784-5023.